Ron Stutzke's 156 lb barn door halibut smashed the Black Gold halibut record. The previous record was a 117 pounder that held the record for several years. 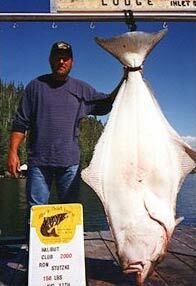 Ron wins a free trip in 2001 for having the largest halibut.